NASA astronaut Andrew Thomas, an STS-114 mission specialist, poses for a snapshot in the shuttle Discovery's aft flight deck during the second day of orbital activities on July 27, 2005. A homemadefilm shot by a NASA astronaut takes a harsh look at the agency?s sometimesimpersonal bureaucracy in hopes of encouraging employees to keep a more openmind when confronted with dissenting opinions or new ideas. Written andproduced by four-time spaceflyer AndrewThomas, the 10-minute satirical video was posted to YouTube - with NASA?sapproval - after being screened at an agency leadership retreat last month. Thefilm follows a young engineer who attempts to present an innovative idea for aspacecraft design only to be stymied at every turn by program managers. ?The pointabout the video is it?s not fiction,? Thomas told SPACE.com Monday. ?Allof those scenes are real. They?ve actually happened to people to various degrees.? The projectis the result of a Barrier Analysis team assembled by senior NASA managers aspart of a wider effort to foster innovation andinclusion at the Johnson Space Center (JSC) in Houston. The center is home toNASA?s astronaut corps and Mission Control rooms for the space shuttle and InternationalSpace Station, among other programs. Thomas saidhe based the script for the film on accounts described by NASA employees andcontractors, as well as some instances that he witnessed himself. In thefilm, the young engineer is met with administrative reasons to reject her idea,but is never given a chance to have a technical discussion on the merits of hersuggestions. In each case, text captions appear to question the reasons behindthe constant objections. ?We?re notsaying this is the universal response,? Thomas said. ?But elements of thosecultural barriers exist at JSC and would stop innovation and inclusion.? Thomas andhis teammates also gave a presentation to NASA officials with suggestions onhow to avoid repeating the situations depicted in his film. He also hopes tomake a sequel, one that illustrates how different management techniques canhelp encourage new ideas. Thomas saidhe and his team did experience some trepidation on how the video would bereceived by NASA managers at JSC. So far, the response has been strong and mostly positive, with JSCdirector Michael Coats giving his approval to make the video public to expand itsreach after its screening last month, he added. ?I found itextraordinarily funny and not at all funny,? 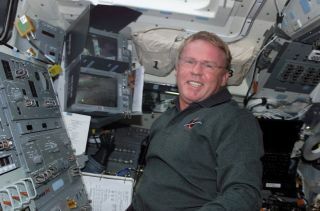 NASA?s former shuttle programmanager Wayne Hale wrote in a NASA blog entry last week. Hale, who now serves asNASA's deputy associate administrator for strategic partnerships, posted thevideo to his YouTube account last week. After the tragic lossof seven astronauts aboard NASA?s shuttle Columbia in 2003, investigatorsfaulted NASA?s internal culture for its inability to hear or act on dissentingopinions. Since then, the agency has worked to foster amore open culture, but there will always be room for improvement. ?I think itis something that does need to be addressed because we don?t want to haveanother accident,? said Thomas, whose last spaceflight - the STS-114 mission in 2005 - was NASA's first shuttle flight following the Columbia tragedy. ?And in our business, that?s what happens whenyou have that kind of culture.? Since Haleposted the video on YouTube on Jan. 27, it has received more than 28,000 viewsby Internet denizens. ?It hasreally been resonating with people,? Thomas said. ?I?m enormously surprised.? Click here to watchThomas?s homemade film on barriers at the Johnson Space Center.